Jeff For Banks: Loan Pricing: Must It Be So Complicated? Loan Pricing: Must It Be So Complicated? When it comes to pricing loans, my experience tells me we use competitor pricing as our de facto pricing model. For consumer and residential loans, where rates and fees appear on the competitors' websites, it's not so difficult. But for commercial loans, I suspect we follow anecdotes such as what customers tell us or what friendly competitors murmur to us at a cocktail party. We tell loan committees that this is the rate and structure needed to "get the deal done". In comes the loan pricing models. Some are expensive. Some are free, such as the one recently mentioned by my friend Dallas Wells of Asset Management Group, an ALCO consulting firm based in Kansas City. Now, I have never been a commercial lender. But I'm a student of the lending function, and listen intently to senior managers discuss loan pricing in profitability improvement meetings that I moderate. That's where I hear the stories of the competition, irrational pricing, yadda yadda yadda. I recently had two students from the Pacific Coast Bankers School (PCBS) ask me about how to risk price loans. Why they asked me, I don't know. Although I'm no loan pricing expert, I have my opinions. And my opinion is it should not be as complicated as those "in the know" would like us to believe. So for you, fair readers, I developed this simple loan pricing model (see table). Four inputs, you say? Well, there is some back room gears at work too. For example, the loan duration should be calculated by the loan cash flows and repricing characteristics. 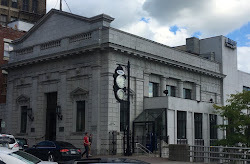 Is it a five year, 20 year amortizing commercial real estate loan? 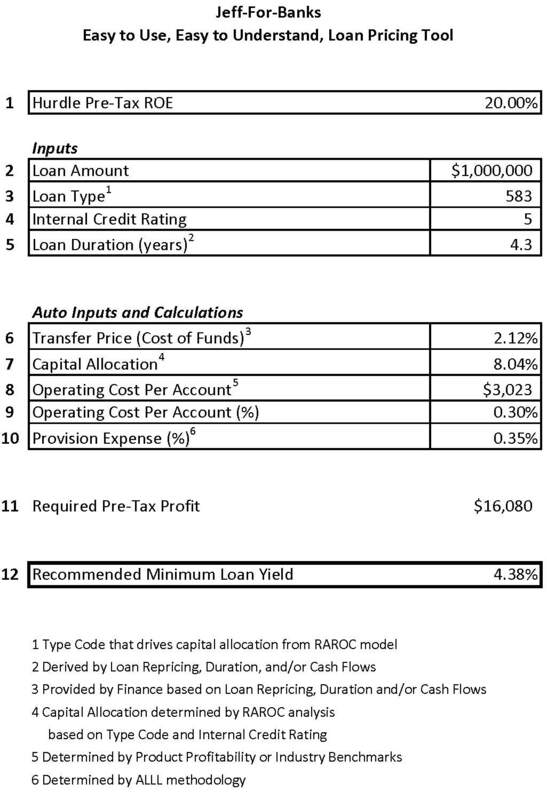 Then perhaps the cash flow calculation pegs the loan duration at 4.3 years, as it does in this model. The transfer price, or charging the lender a cost of funds for the borrowed money, is typically derived from a rate index, such as the Federal Home Loan Bank yield curve, for the same duration borrowing. That would have to come from Finance and be blended for odd-lot terms, such as 4.3 years. Capital allocation should be determined by a risk adjusted return on capital model (RAROC). I described this in greater detail in a previous post. But this analysis would have previously occurred, and be assigned based on loan type code and the internal risk rating. If your bank performs product profitability, a natural calculation from this model is operating cost per account based on type code. If you do not have product profitability, you can analyze your approximate operating cost per account or use industry benchmarks. And lastly, the provision expense associated with this type of loan and risk rating should be driven by your Allowance for Loan and Lease Loss (ALLL) methodology. You already do this, I guarantee it (insert Men's Warehouse founder voice). There you have it. Now you have a well priced loan that accounts for credit risk through the provision and RAROC calculations. Interest Rate Risk is accounted for in the transfer price, as this is taken from the same duration market instrument. You also account for other key risks through RAROC such as liquidity and compliance risk. Price by this method, and you are accounting for the risks, costs, and desired margin of each loan. You can overlay deposit products to hit your ROE targets in a similar vein. Price by this method, and you can determine if doing a loan at a certain price point, as told to you by your borrower, may or may not be a mutually beneficial pricing structure. Banking is one industry where success is driven not only by your ability to build relationships that are not price driven, but also by not being as stupid as your competitors. If the market price is too low for your appetite, have the courage to walk away. What else should be considered in pricing a loan? Jeff - very good post and being a big fan of the KISS principle, I like the simplicity of the model. The derived "Recommended Minimum Loan Yield" is ... or should be ... substantially different from product pricing. The result displayed in this analysis would equate to final pricing only if a Bank was competing based on price; however, those Banks that compete based on Relationship (aka Value) then the result should provide an indication of break-even costs ... the banker would still need to determine the appropriate pricing structure. Model is fine. Banker should have ability to adjust spread over TP cost for relationship/competition. With limits of course, but they should be allowed some flexibility. I think the flexibility comment based on relationship is a fair point. But the challenge becomes, in practice, this may result in the downward pricing and profitability of relationships, as we reduce pricing to "keep a good relationship" (counter-intuitive, in my opinion). So, if you are a believer of the 80/20 rule, then the result may be that you are gravitating toward 81/19, 82/18, etc. Holding relationship managers accountable for the ROE of their portfolio may mitigate this risk. So how did you arrive at 4.38%? Actually, it is (Row 11/Row 2)+Row 6+Row 9+Row 10.
can regulatory capital charge be used if the bank does not have the economic capital charge available? Absolutely. If incorporating risk, then you would need to risk-weight the asset. That's how regulators up the capital for perceived riskier assets. May I ask.. how was row 7 incorporated in the result and how do you get to row 11? Row 7, Capital Allocation should be determined by your institution's perceived risk, and therefore capital needs, for the product. So your board may say 5% is your base capital, and a buffer for commercial real estate loans with a 6 credit rating is 3%, then your capital requirement for that product is 8%. Some similar type of analysis should be part of your institution's capital plan, as well. Row 11 simply takes the ROE hurdle rate * capital allocation * loan amount. You Can't Buy a Customer's Love?